This Post details the daily power consumption data for the AEMO coverage area in Australia. For the background information, refer to the Introductory Post at this link. Each image is shown here at a smaller size to fit on the page alongside the data for that day. If you click on each image, it will open on a new page and at a larger size so you can better see the detail. 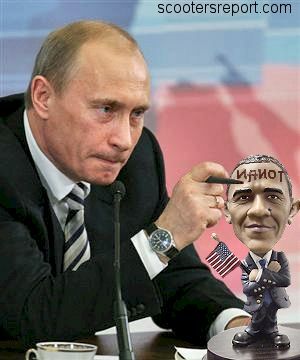 Note also the scale change for some of the images. That scale (the total power shown on the left hand axis) has been changed to show the graph at a larger size. 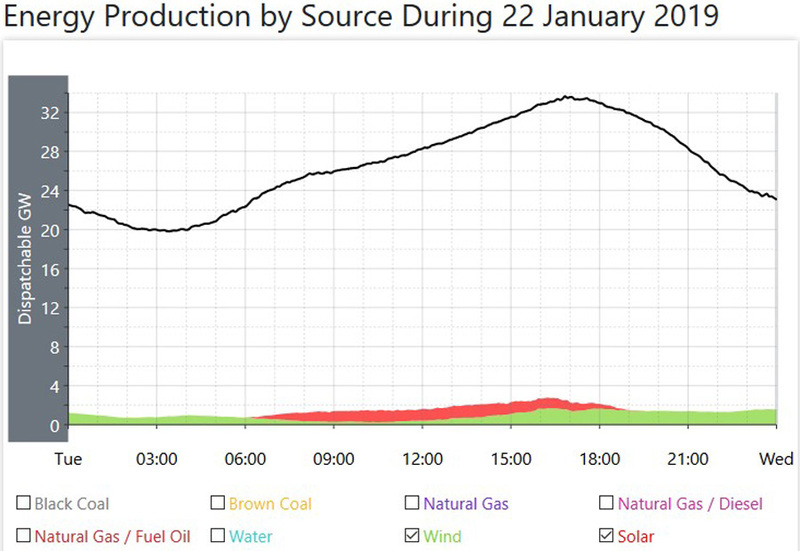 Here, the black line across the top of the graph shows the total power generation from every source. This is also similar to the total power consumption, which is slightly lower after minor grid losses are taken into account. The dark grey colour is for the black coal fired power generation. The yellowish colour is for the brown coal fired power generation. The purple colour is for natural gas fired power generation. The blue colour is for Hydro (water) power generation. The green colour is for wind power generation. The red colour in the dip between the two peaks is for solar power plant generation. Rooftop solar power is not included on this graph, as this shows just the power generation from all power plants only. Here, the upper black line is the total from all fossil fuels, and this is the same as the blue line in the image directly above. The black line just under that top black line is the Sub Total just for coal fired power. Note here how closely that coal fired line follows the shape of the upper Load Curve, and this indicates that coal fired power can be ramped up and down to follow actual power consumption. This image for Natural Gas Fired Power Generation shows the gap between the total for all Fossil Fuelled Sources of power generation and Coal Fired Power Generation in the image directly above. Note here how closely the shape follows the total power generation Load Curve in the top image, indicating how these natural gas fired plants are used to smooth out the load curve to match actual power consumption. This Image shows just the gap between total power generation from every source and the total power from renewable sources only. It is the same image as the first image at the top here, only with the fossil fuelled total (the grey, yellow and purple colours) removed from the graph, As in that top image, it shows Hydro Power, (blue colour) wind power, (green colour) and solar power. (red colour) This image is used here to highlight the gap between the total power generation and the total from renewable sources alone. This image shows the power being generated from the seven smaller sources other than the major sources of power generation. These include Natural Gas/Diesel, Natural gas/Fuel Oil, Coal Seam Methane, Diesel, Kerosene, Waste Coal Mine Gas and Bagasse. All of these are fossil Fuels, excepting Bagasse which is sugar cane waste mostly used to provide main and auxilliary power at sugar mills. Note the scale change here, as these are smaller producers of power, and the scale is changed so they can be more easily shown on the graph. For the data here, I have just added the average generation across the day, the total generated power from all these sources, and the percentage of the total. This image shows all Hydro power generation. It is the same as the orange line in the top image for power generation from all sources. 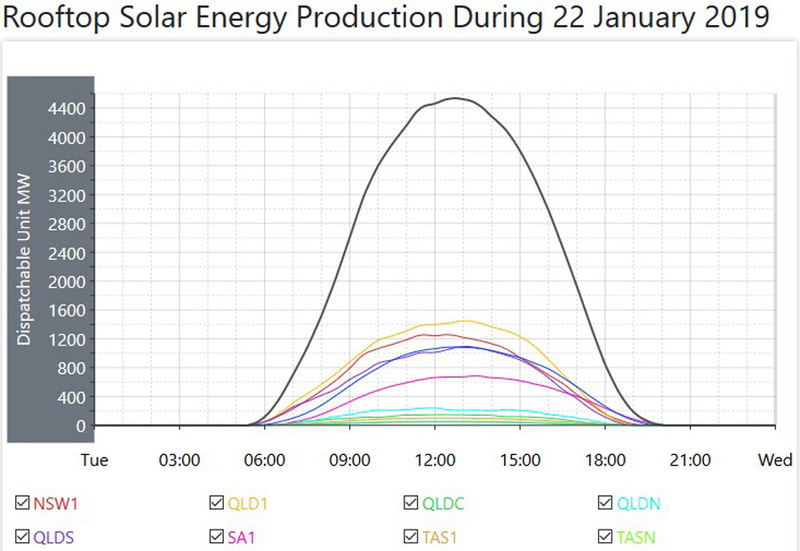 Again, note here that the shape of this load curve follows the shape of the main load curve for all power generation, in that it has similar peaks in the morning and for the main evening Peak. The coloured lines at the bottom of this graph indicate the power generation from each of the hydro plants in this coverage area. This image shows the total power generated by every wind plant in this vast coverage area. It is the same as for the purple coloured line in the image at the top showing generation from all sources. The total Nameplate for all these wind plants is 5661MW. Note that the shape of this load curve does not follow the shape of the main load curve for total power generation. Wind power generates its power only when the wind is blowing, hence it does not follow actual power consumption levels. This image shows the total power generated from all the solar power plants in this coverage area. This is the same as for the red coloured area you can just see in that top image. The total Nameplate for all these 29 solar plants is 2241MW. As this source of power generation is classed as ‘behind the meter’, it is not included in the total power generation. Note here that the State of Queensland (QLD on the legend under the graph) is broken down into four separate areas as this is the largest State with the largest number of installations. While the total Nameplate changes often, the latest information is that the total is now 7800MW, and that is a large total. However, that total equates to 1.8 Million homes with panels on their roof. That equates to an average sized installation of 4.3KW. Most of the power is consumed by the homes with the panels, and what is fed back to the grid, while seemingly still high is spread across that huge number of installations across the whole of this coverage area. This image shows the total power generated from all the wind plants, and all the solar power plants in this coverage area, combined in the one image, and compares it to the overall total generated power, the black line at the top of the graph. Wind power is the green coloured area, and solar plant power is the red coloured area, and these are the same as shown in those other coloured images at the top of the Post. I have also added the total generated power for both wind and solar plant power combined, and the percentage of the overall total below for the maximum power from both sources with respect to the overall total, both at the maximum for both, and then for the total for both at the daily peak Power time. Finding Averages – On each (non solar) graph, there are 25 hourly time points, starting with midnight and finishing with midnight. I have added the total at each time point together, and divided by 25. For both solar power averages, I have used the same addition of hourly time points and then divided by the same number of those time points of actual generation. Every so often, as the days get longer (or shorter after Summer) I change the hours of generation as those hours change. For total power in GWH, multiply the average daily power by 24, and then divide by 1000. The total percentages for coal fired power, natural gas fired power, all renewables, and those other smaller sources add up to 100%. The total percentages for Hydro, Wind, and Solar adds up to the total percentage for all Renewables. On this day, overall power consumption rose markedly, and power generation was way up to cover that. The evening peak at 5PM was also considerably higher at 33600MW. The rise in the average was to 27400MW, a rise over yesterday’s high of 1950MW, and that was 7.7% higher. 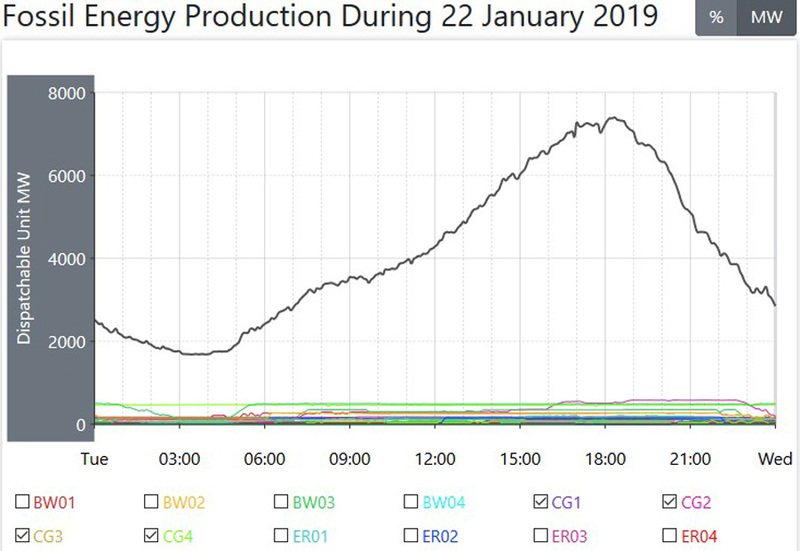 It’s also worthwhile comparing this days average with the lowest day of the week, Sunday, barely two days ago, when that average was only 22150MW, so this day was 6250MW higher a huge rise of 23.7%. The average for coal fired power actually fell a little on this day, down to 18730MW, a small fall of just 40MW. This was due mainly because Unit 3 at the Loy Yang A plant in Victoria went off line at 2PM, and dropped back to zero at 3PM. 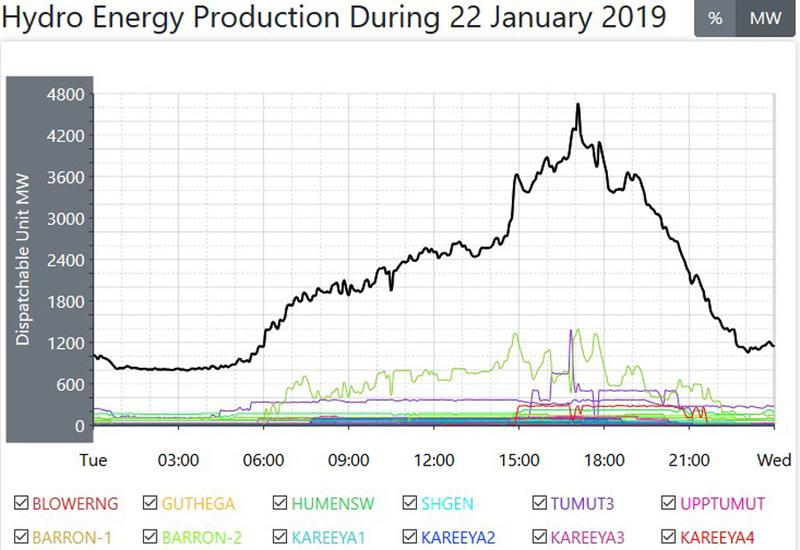 In Queensland, Unit 3 at the Tarong plant also went off line at 3.30AM, but was back online at 9.30AM six hours later, and was back at full power by Midday. There are now three of those coal fired Units off line. 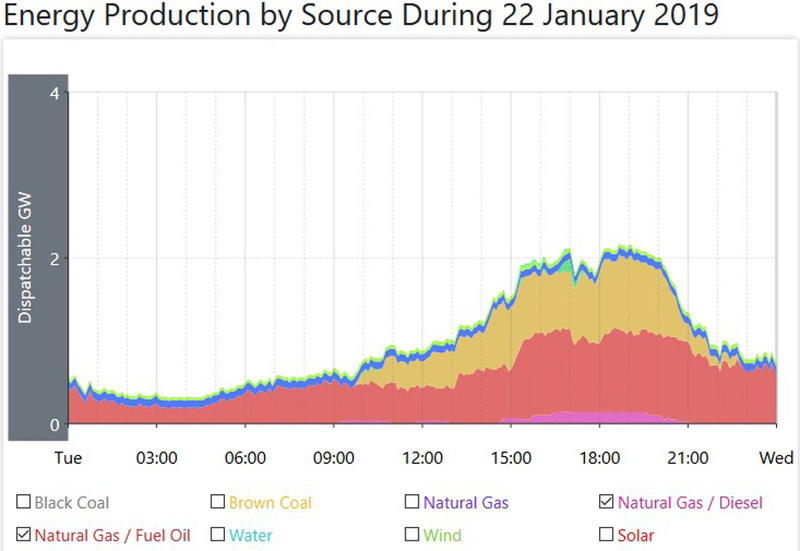 As you can see from that second graph, the gap between all fossil fuels (the upper black line) and coal fired power (the lower black line) it is obvious that natural gas fired power played a huge part during the day of covering that large rise in power consumption, and you can then see that on that third graph. That average for natural gas fired power was higher by a full 1140MW to an hourly average of 4090, and at that evening peak, was delivering a pretty huge 7400MW and across the day, its percentage of the total was the highest it has been this Summer at just under 15%, and for a usually small supplier of power, on this day natural gas fired power delivered more power into the grid than the three sources which make up the renewables total. 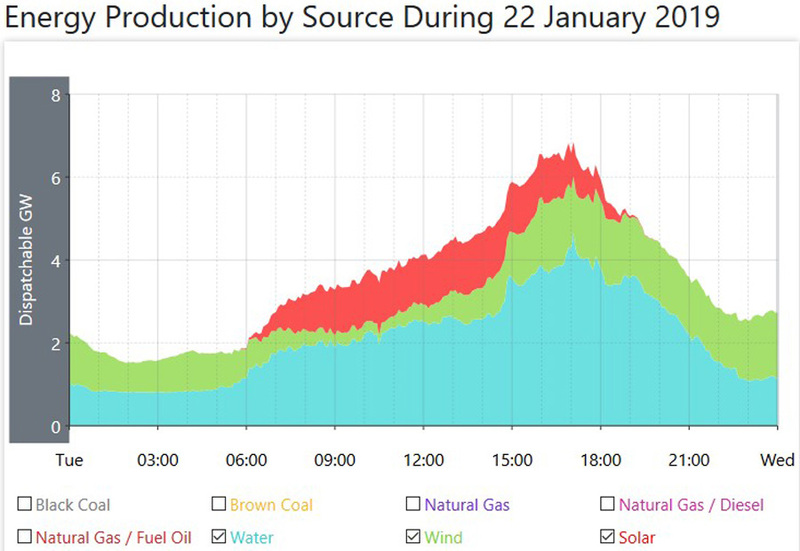 The average for those smaller Other sources was also way up on the day, up by 350MW to an average of 1040MW. The average for hydro was also a lot larger on this day as well, up by 580MW to an average of 2090MW. 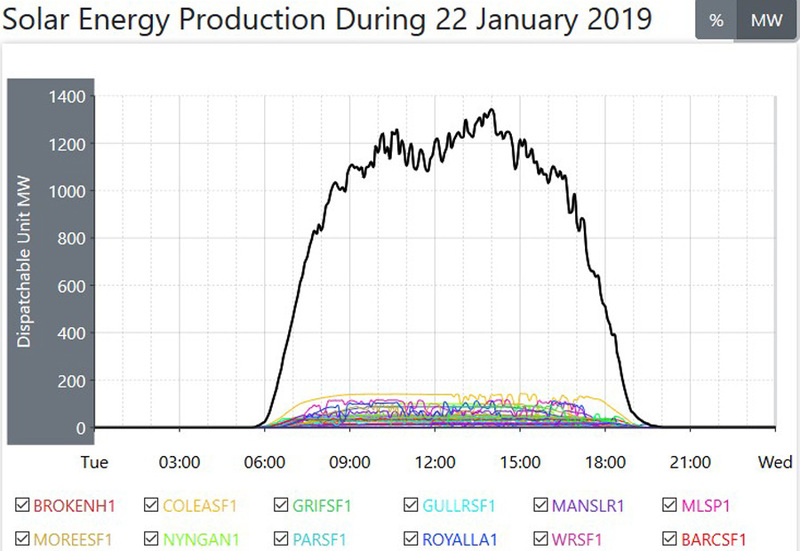 You can see on the graph (that green line) that the huge hydro plant of Murray One and Two was on line for a full 18 hours across the day, delivering more power from hydro than any other single plant. 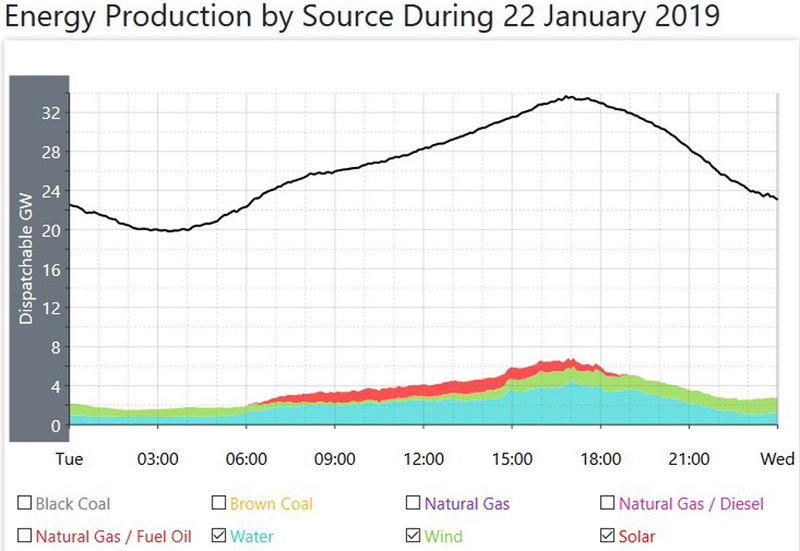 It was also a case of needing help from the rarely used Tumut 3 plant, the pumped hydro plant in the Snowy Scheme, (that purple line on the graph) as it too delivered power to the grid and it was online for six and a half hours around the evening peak, with most of its Units running as well. The average for solar plant power was slightly higher by 20MW to an average of 490MW, but keep in mind here that this source of power was only delivering 1.8% of the required power. The average for wind power was lower on the day, down to under 1000MW, with an average of only 960MW across the whole day, a fall of 100MW. This average of 960MW gave wind power a daily operational Capacity Factor (CF) of 16.96%, and at one stage wind power was only delivering 250MW, at a CF of only 4.4% pitiful really, from a source of power we are told is going to become all we have to rely on. With respect to wind power, note that on a day when overall power generation is critical to supply the huge increase in power consumption, wind power goes missing, delivering only 3.5% of the required power across the whole day. Note that hourly average for wind power, 960MW, and compare that to the average hourly power generation from coal fired power, 18730MW. So, in one average hour, coal fired power delivered the wind power total in three minutes and five seconds. 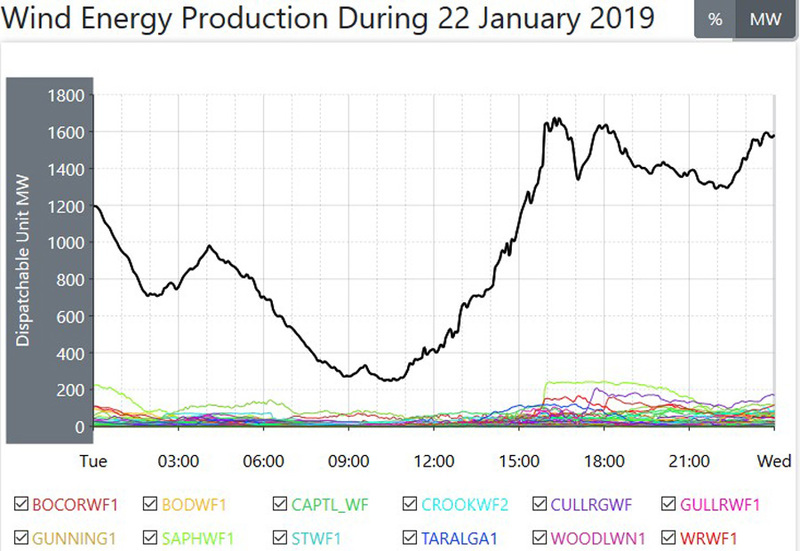 Now look at the total power delivered across the whole 24 hour day by wind power, 23.04GWH, and compare that to the total power delivered across that same 24 hours by coal fired power, 449.52GWH. 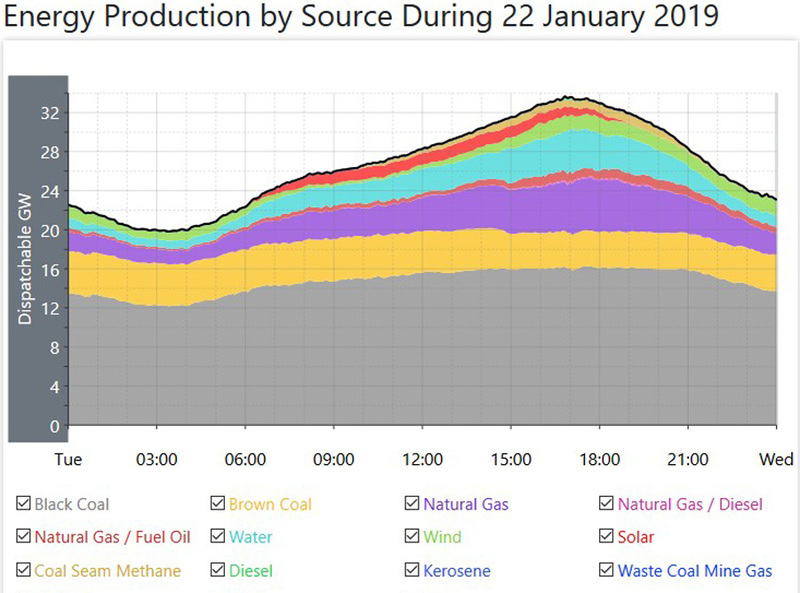 So coal fired power delivered that 24 hour total from wind power, and did it in 74 minutes, and then again in the next 74 minutes, and then again, etc etc. On a day when the overall rose by so much and even with coal fired power delivering close to the best it can deliver, coal fired powers percentage of the total was down to 68.36% but only because the overall rose by such a large amount and the share from natural gas mainly was so much higher than usual. Add up the power delivered from that ‘dreaded’ CO2 emitting sources, and that comes in at 87% of all the delivered power across this day.